Malastrana is one of Barbara Bach's several pre-007 Italian thrillers. Its dubbed MPI Home Video title is Paralyzed. 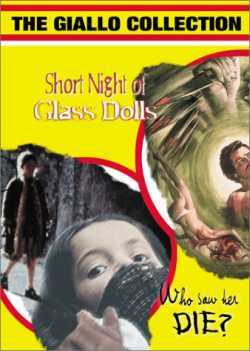 Another dubbed US title is Short Night of the Glass Dolls. I'm undecided whether the American-born Bach, fluent in Italian, dubbed her own voice. As she is the best known in the cast to contemporary American audiences, Bach gets first billing on the MPI box, although she mainly appears in only a few early scenes. Paralyzed opens with a man believed dead who, we soon learn, is alive but paralyzed, his condition unknown to all. Will they bury him alive? Will they perform an autopsy? It's an old conceit invigorated by flashbacks as the man tries to remember how he arrived at his predicament. Intercut with scenes of his paralyzed body being ferried about the hospital, these flashbacks comprise the bulk of the film. The man (French-born Jean Sorel) turns out to be a Western journalist whose Czech fiancée (Barbara Bach) disappeared, propelling him on a search. Thus, Paralyzed interweaves a medical thriller with a mystery film. Yet because of its mise-en-scene (its Prague setting and black leather jacketed Communist police), it also imparts the sensibility of an espionage thriller. And as the tale progresses, it becomes an occult thriller. This blend of mystery, foreign intrigue, and the occult has been done elsewhere. Former "Watergate conspirator" and CIA intelligence officer E. Howard Hunt was also a remarkably prolific novelist who published numerous thrillers under various aliases (e.g., David St. John, Gordon Davis, Robert Dietrich), sometimes spicing his novels with the occult (The Coven, The Sorcerers). The X-Files episode, "Musings of a Cigarette-Smoking Man," was inspired by the real-life Hunt. It's difficult to discuss Paralyzed in detail without spoiling the surprise ending. Thematically, Paralyzed posits a millennia-long exploitation of the freedom-loving young by the Satanic elderly. The film not only features threatening commissars, it depicts old people as inherently scary, a device used in Rosemary's Baby and The Sentinel. In one scene, Jean Sorel sneaks past a decrepit group of Communist Party hacks in evening dress, male and female, listening lifelessly to a slow-moving classical concerto. Their faces are pasty white, reminiscent of the dead souls in Carnival of Souls. This image contrasts starkly with another scene featuring a lively young, long-haired folk singer. Style-wise, Paralyzed is your typical 1970s Euro-thriller. Lots of telephoto shots with shifting focus, heavy use of zoom lens to create energy (the pre-MTV equivalent of a shaky camera and frenetic editing), and badly dubbed dialogue. A curious and enjoyable film.